Kitchen Window: Sous Vide Makes Its Way To The Home Kitchen This cooking method — a strange mix of the precise and the forgiving — means never having to worry about rubbery, overcooked meats. But mind your eyebrows while you're holding the blowtorch. 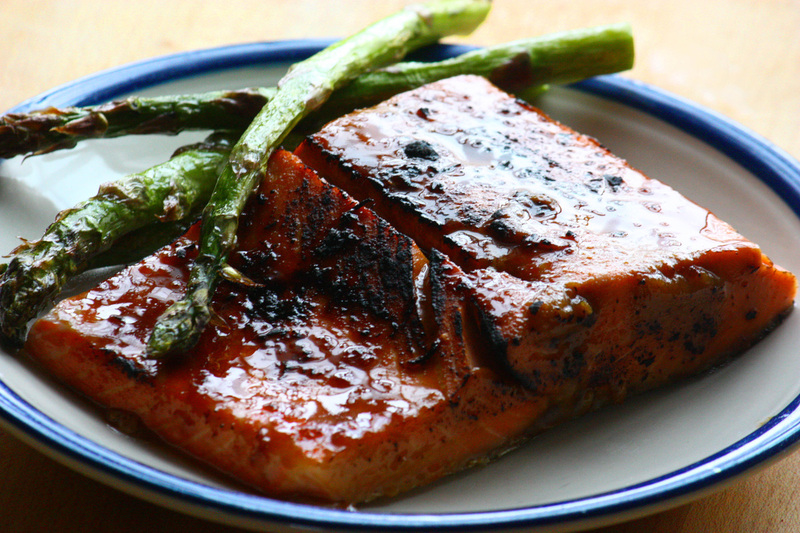 A salmon fillet cooked sous vide, with miso-ginger glaze, gets a crisp finish under a broiler or torch flame. Get recipes for Sous Vide Miso-Ginger Salmon, Sous Vide Pork Belly, Sous Vide Basic Burger and Sous Vide Herbed All-Purpose Chicken Breast. Sous vide. Not that long ago, it sounded so exotic — or, at least, so French. It was a phrase that belonged in restaurants, amid white tablecloths and flower arrangements and hushed conversations. Alternatively, it was a word that belonged to the modernist kitchens just beyond the swinging doors — kitchens filled with gleaming dehydrators and transglutaminase "meat glues" and spherification siphons and more. I first heard it in the kitchen of now-famous Wylie Dufresne's first restaurant, 71 Clinton Fresh Food, where I was a clueless intern in the spring of 2000. There in New York City's still-scruffy Lower East Side, early hipsters with interesting facial hair waited the tables, while in back we fashioned fish crusts out of edamame. It was a forward-thinking place, yet no one even there imagined that the mysterious vacuum-and-water-bath technique chefs were whispering about would be part of many home cooks' arsenal in just 15 years. What is sous vide anyway? Briefly, it's cooking "under vacuum" — i.e., in a vacuum-sealed bag — at a specific temperature. Usually, that means in a temperature-controlled water bath. Why would you want to do this? Because careful temperature control results in a kind of protein sorcery. You can get perfectly cooked delicate fish because it can't dry out or overflake. You can coax meats into meltingly soft braises because the protein never gets hot enough for the fibers to turn to string. You can get eggs that are never rubbery. You can melt the layers in pork belly without liquefying them in the process. You can even keep chocolate from losing its glossy temper when melted. The exactness of the temperature allows you to be loosey-goosey with the time. No matter how long you hold a water bath at 155 degrees, it will never boil and toughen your chicken tenders. And you cannot accidentally toughen a filet mignon if it's just sitting there, relaxing, at 145 degrees. All in all, sous vide is a strange mix of the precise and the forgiving. It's the forgiving part that makes it a natural for home cooking. But it's the precise part that scares people. At the dawn of home sous vide — a mere five or six years ago — you could buy an industrial thermal circulator to submerge in your water bath. It cost, oh, a mere $1,000. Then came the Sous Vide Supreme, an all-in-one unit that cut the cost in half. 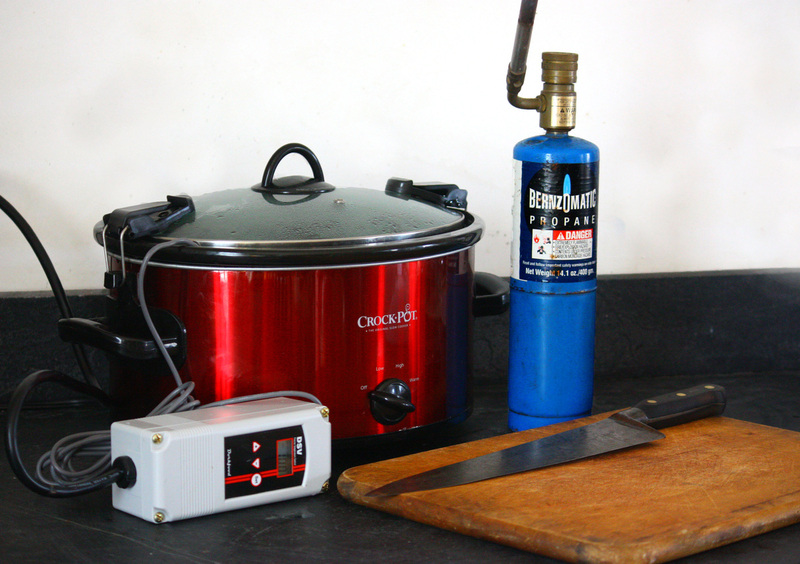 Or you could rig your own, using a rice cooker or slow cooker, a thermocouple and a temperature controller. There are wiring diagrams on the Web, and in books such as Jeff Potter's Cooking for Geeks. And the fact is, you don't even need to do that much. I have friends who cook steaks sous vide in foam beer coolers, keeping track of the temperature with an oven thermometer probe and adding some hot water from time to time. You don't even need a vacuum sealer — you can make do with heavy-duty Ziploc bags, as long as you've displaced the water out. (You do that by slowly lowering the bag into your water bath, so the pressure of the water squeezes the air out, and then you seal it the usual way). There is, of course, the question of food safety. Maybe you've heard the stories about city health department officials forcing chefs to pour bleach on their sous vide meats. It's a story that always makes me want to cry, but for years public health has relied on a firm food safety rule: dangerous germs live at between 40 and 140 degrees Fahrenheit. Even the pink interior of a medium-rare burger falls above this range, and most cooking techniques take place around or well above the boiling point of water (212 degrees F). But not sous vide, whose finesse depends on letting some proteins denature while leaving others be. For example, if you're cooking a beef braise, you want chewy myosin fibers to relax, which happens by the time you reach 130 degrees. Collagen dissolves, for that velvety mouth feel, around 141 degrees. But actin fibers tighten at 150 degrees, squeezing out moisture and resulting in that ropy, dry texture we know all too well. Aiming for that window — above 140 degrees for safety, below 150 degrees for texture — isn't hard if you're set up to control temperature within a degree or two. And you can pasteurize your protein by holding it there for long enough. Once you've reassured yourself that you're not taking your life (or at least your gut microbiome) into your hands, there's really just one more question, and it tends to come up when you're dealing with red meats. How can I get that beautiful brown caramelized meat-crust I love so much when my food's been soaking in a plastic bag? The answer is, pretty much the usual way — by searing it with a hot flame. You can sear it before, or you can sear it after. You can use a skillet or a broiler or a grill. Personally, I prefer a blowtorch — the kind of Bernzomatic propane torch you get at the hardware store for under $20 (although if you want to spend twice as much, you can get one of those cute little torches people get for finishing their creme brulee). There's something fine and fearless about holding 20,000 BTU in one hand. It inspires a kind of spiral of confidence — the kind of confidence that comes from knowledge. I'm not afraid of cooking meat! I'm not afraid of unfamiliar gear! I'm not afraid of food poisoning! And I am not afraid to wield this blowtorch, with a wineglass in my other hand! One's first glance at a sous vide recipe tends to be underwhelming, because sous vide is a technique that depends on measurement, rather than a series of specific actions and instructions. I've included here a few introductory recipes for getting started with basic sous vide. However, how you choose to set up your sous vide is a matter of personal taste. Some options: the Sous Vide Supreme, the Dorkfood DSV Temperature Controller or simply a digital probe thermometer and a foam cooler. You can do just fine without a vacuum sealer, but if you want one, Foodsaver offers many popular models. 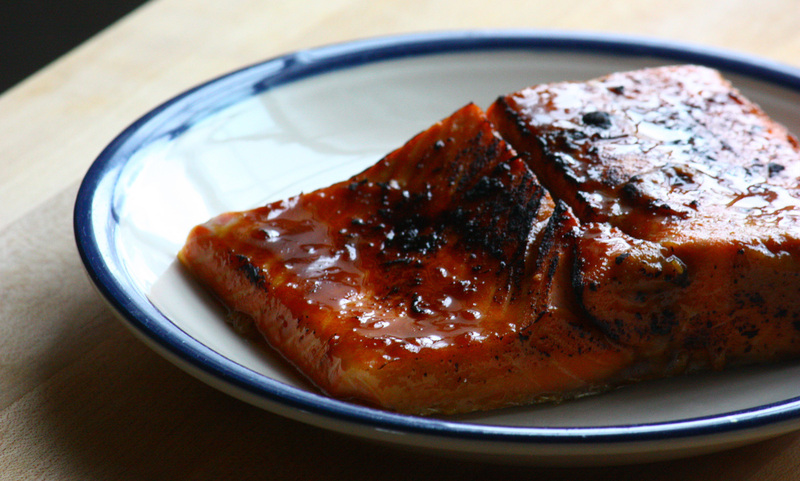 Salmon is a perfect protein on which to test your newfound control. You can practically see the transition from translucent to opaque as you raise it degree by degree. You could simply adorn it with a slick of butter, but I especially like this miso glaze. Dissolve the salt and sugar in 1 cup of warm water, pour into a zip-top bag, add the salmon and seal. Allow the salmon to sit in this brine in the refrigerator as you bring the water bath of your sous vide up to your target temperature (115 for rare, 120 for medium-rare). When the water bath has reached the target temperature, remove any excess air from the zip-top bag by displacement if you're not using a vacuum-sealed bag. Drop the salmon into the bath. It should take about 1/2 hour to come to temperature. Meanwhile, make the glaze: Combine the miso, ginger, oil, honey, tamari and mirin in a small saucepan. Whisk as you heat the glaze until it bubbles and thickens slightly, without charring in the pan at all. Remove the cooked salmon from its bag, pat dry and place skin side down on a fireproof surface covered with foil (a baking sheet works well). Liberally apply the glaze and set it with a propane blowtorch turned up just shy of full blast. Alternatively, you can run the glazed fish under the broiler. Don't take longer than a minute for either technique, so you retain the luscious, just-cooked texture of the interior. Pork belly is one of those cuts that melt so beautifully when you braise them, it's hard to imagine it could be even more succulent if only you could cook it 75 degrees lower than the usual simmer. And yet it is. Cooked at 144 degrees for two days, the lean meat fibers sandwiched between the layers of fat stay plump and juicy. The technique and sauce are adapted from Nathan Myhrvold's seminal Modernist Cuisine at Home (The Cooking Lab, 2012), which is invaluable to any sous vide adventurer. The Korean chili paste you can find in Korean markets, but other chili pastes will also work. The target temperature of the water bath is 144 degrees. Seal the pork belly chunks in a gallon zip-top bag, displacing the air (or use a vacuum sealer), drop in the bath and cook for 48 hours. Combine the remaining ingredients in a saucepan, warming gently and whisking to blend. When the pork belly is finished, lay the chunks on a fireproof surface covered with foil (a baking sheet works well). Liberally apply the glaze and set it with a propane blowtorch turned up just shy of full blast. Alternatively, you can run the glazed chunks under the broiler. But the torch allows you to turn and evenly coat each side of the pork. 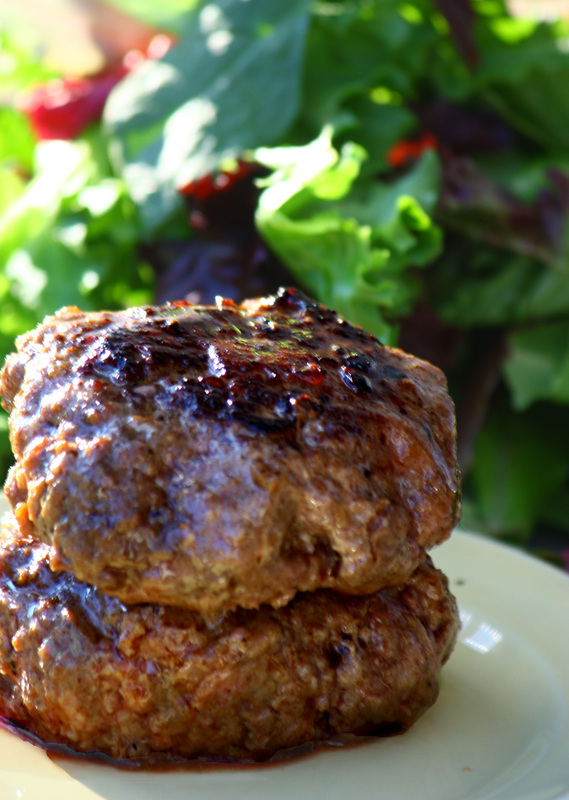 The basic idea behind this recipe comes from Wicked Good Burgers (Fair Winds, 2013), whose "Fifth Dimension" seasoning powder turns out to be very close to the seasoning I've always used for burgers. Doneness in a sous vide burger is very evenly distributed from one side to the other, so rather than having a crusty exterior, a thick chewy layer and then a soft pinkish interior, you have a uniformly pinkish interior and a thin layer of meat crust — no chewy gray layer. (I'm using medium-rare just as an example.) There's virtue in both a sous vide and a regular burger. But the sous vide burger is much more predictable. Mix the raw beef, mushroom powder, garlic powder, Worcestershire sauce, salt and pepper together evenly with a fork. Gently form into 8 patties. Pack 2 at a time in a single layer in a zip-top quart bag, or seal in plastic using a vacuum sealer. Freeze for about an hour. Bring the water bath up to 120 for rare, 125 for medium-rare. Drop the bagged frozen patties in the bath (displacing any air pockets first); the meat will take about 1 1/2 hours to get to its target temperature. Once the hamburgers reach the desired doneness, remove them from the bags and pat dry. Heat a heavy skillet or grill pan over high heat until a wisp of smoke appears, add enough oil to coat the base, and sear the burgers for a minute on each side. (Sear in two batches if necessary.) Serve as you normally like your burgers — with toasted buns or caramelized onions or condiments, or the works. You can really use any herb combination here, as long as you use liberal amounts and crush them to release the flavor. You can use the chicken breast for sandwiches, in chicken salad or give it a sear and eat it as is. 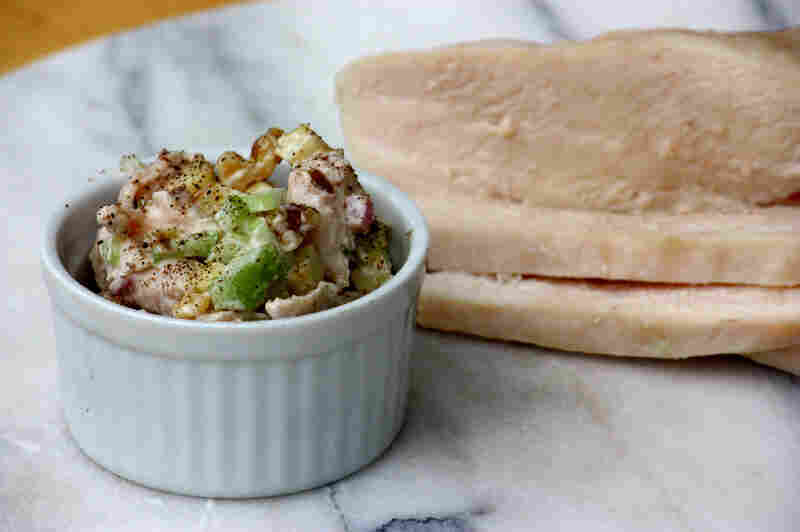 (It's ideal for chicken salad because of the smooth, perfectly even texture). Sous Vide Herbed All-Purpose Chicken Breast is ideal for making chicken salad because of its smooth texture. 1 boneless, skinless chicken breast (2 breast halves), about 1 pound. Bring the sous vide water bath up to 140 degrees. Crush the garlic and tarragon sprigs together lightly with the side of a knife or in a mortar and pestle. Place the garlic and herbs, along with the oil, chicken and salt, in a zip-top bag. Massage briefly to distribute the seasonings. Seal the bag and place it in the bath. You'll need 1 to 1 1/2 hours to cook the chicken to the target temperature.